I’ve always been a fan of Lance Snack products. Purchasing inexpensive snacks for my children’s school snacks can be a challenge on your budget. Lance has made this challenge fairly easy with muti-packs of snacks in a large variety for a relatively lower cost! Each multi-pack contains normally 6-8 individually wrapped and portioned snacks. Don’t let the low prices fool you. My family, especially my children enjoy the taste and quality of these snacks. Our favorite Lance Snack to enjoy is the peanut butter or cheese snack crackers. My son especially loves to eat the Cream cheese and chives Captain‘s Wafers. The fillings are creamy and delicious. I personally don't care for gritty cream filled snacks and this is something I don't worry about when purchasing Lance products. These snacks are perfect for on the go! Slip one into your purse, lunchbox, backpack, etc. The possibilities for enjoying these snacks are endless. We have around 5 different packages of Lance Snack‘s in the pantry that is taken daily to school. My husband also carries a package of Lance snack’s with him while at work. We have been consumers of Lance products for years now and will continue being loyal to this company. Lance has made healthier snacking easy with the new selections of Whole grain and 100 calorie pack products! Healthy eating doesn’t have to be bland and tasteless, try them for yourself and you will understand what I’m talking about. These products are very flavorful. For nearly 100 years Lance® sandwich crackers and snacks have been satisfying the cravings of millions of hungry individuals and families. Every Lance® sandwich cracker is baked fresh with real peanut butter or cheese, and no preservatives, trans fat or high-fructose corn syrup. These are just some of the little things Lance does to make good-tasting snacks that kids like to eat and you can feel good about offering to your family. A great deal has changed at Lance over the years. What began as 500 pounds of unwanted peanuts and the faith and vision of one man back in 1913, has grown and evolved into a multi-million dollar national company. What hasn’t changed, however, is the spirit of The House of Lance. Lance’s customer-focused philosophy and family atmosphere has guided the company since its beginnings, and continues to do so today. Our dedication to community, to each other, and, most importantly, to delivering superior quality snack foods to you, our customer, is the driving force behind all that we do here at Lance. This dedication has earned us a loyal customer base that allows our company to continue to mature and adapt; bringing you the new and innovative snack foods you want—and, of course, a few tried and true favorites. Through it all, our mission is simple: To satisfy America’s snacking appetite. Interested in learning more about How it's made? Since its inception in 1913, Lance has been dedicated to providing fresh, great tasting snack options for your busy lifestyle. Every variety of Lance® sandwich crackers is made with fresh baked crackers and real peanut butter or real cheese filling, and no preservatives, trans fat or high-fructose corn syrup. These are just some of the little things Lance does to make good-tasting snacks that kids like to eat and you can feel good about offering to your family. Lance manufacturing facilities follow “best in class” quality programs. Our Charlotte, North Carolina facility is SQF-certified. What does SQF-certified mean? Designed as a food safety program, SQF is a world recognized quality and safety certification program. SQF certification ensures product quality and is the only certification program endorsed by the Global Food Safety Initiative (GFSI) for primary production as well as manufacturing, food storage and distribution and agents/brokers. Our operators are also trained in “sensory evaluation” to ensure our products maintain the appearance, taste, and texture that you’ve come to love throughout the entire manufacturing process. I'm excited to announce that Lance has generously offered to sponsor a giveaway!! 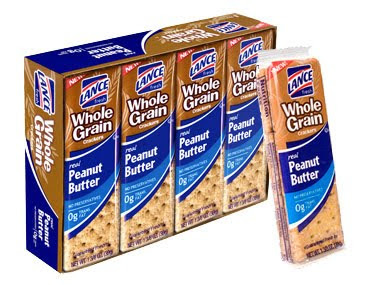 One winner will win an assortment of Lance Whole Grain crackers and 100 calorie packs. MANDATORY ENTRY: Let me know what your favorite Lance snack product is! I received a box of snacks from Lance to share the products with my readers. However, I have posted my own unbiased opinions on these products. All opinions are strictly my own and true as I am a loyal Lance consumer. My favorite Lance snack product is Hot & Spicy Peanuts. Following with GFC. Matt S.
I would love any of the peanut butter filled ones, of course since I am trying to eat healthier I would have to go with the whole grain ones. Though I'm sure they are awesome too. I like the peanut butter crackers. I LOVE their Nip Chee crackers. My favorite is the Sunflower Seeds. Cheese and Peanut butter crackers are my favorite. I buy them whenever I go into a convenience store for a snack. I love the Cream Cheese & Chives Captain's Wafers. I like the Cheese and Peanutbutter crackers. I like the Nip Chee Crackers. My favorite is the cheddar cheese sandwich crackers. We primarily buy two kinds, the cheddar cheese for myself for snacks at work, and the peanut butter for the kids, they love having these in their backpacks! I love the cheese on cheese. Our family loves their Toast Chee crackers! OMG! These take me right back to when I was little, I love the Cheddar Cheese filled variety. I haven't had these in YEARS! How fun! I like the Cheese on Wheat crackers...we buy so many Lance products! My favorite has always been the cheese on cheese variety. I've loved these ever since I was little and would share a pack with my dad. I like the Peanut Butter Crackers. Been so long since I've had them. Thanks! I love the Chee Nip crackers with the cheddar cheese filling! Yum! I like their Reduced Fat Toastchee® crackers. 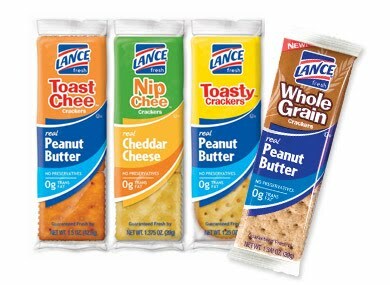 I choose the Lance® Sandwich Crackers: Nip Chee as my favorite! Whole grain peanut butter crackers. My favorites are the Cream Cheese and Chives Captains Wafers. we love their Nip Chee Crackers! The Lance snack cracker I like best is the cheddar-cheese cracker. All of them really. Thank you. I follow, like and subscribe. I like the Nip Chee Crackers!